The entire activities of GOPA-International Energy Consultants and its foreign branches are led by the Management Board (MB). Based on a matrix responsibility, the group of Executive Directors (EDs) monitors and supervises the business activities of the Headquarters as well as the technical and organizational handling of the projects according to the Management Systems of the company. In addition, each of the main foreign branch offices is operated by a regional Managing Director responsible for business of the regional entity. They cooperate with the Headquarters in regional and international projects and report directly to the Management Board. Klaus Langschied (1968) studied energy and heating technology at the University of Applied Sciences Giessen/Friedberg, Germany and holds a M.Sc. degree in energy and heating technologies. Immediately after his graduation, he began a successful career in international consulting and managing several business units within various energy consulting companies of international reputation. Furthermore he held during his career a management position within a German EPC company recruiting worldwide power systems projects. 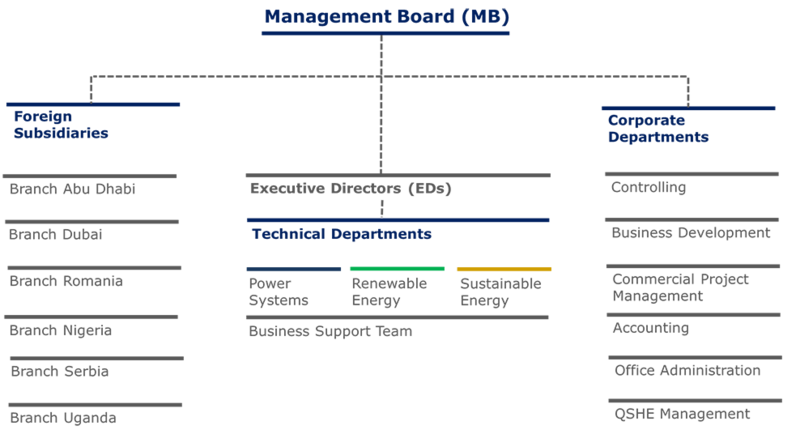 Since 2009 he manages our core business line Power Systems and in 2012 he became Managing Director. Klaus Langschied was one of the founding members of intec and has played a decisive role in the outstanding success of the company. Prof. Dr. Andreas Wiese (1964). With a degree in mechanical engineering from the Technical University Darmstadt and a Ph.D. from the University of Stuttgart, Dr. Wiese draws on some twenty-seven years' experience in the international consulting business. He successfully worked as engineer, project manager, head of department and head of business units in an internationally renowned company. In 2014 Dr. Wiese joined intec’s Managing Board and successfully runs our business lines Renewable Energy and Sustainable Energy. In recognition of his outstanding teaching and research in the field of the renewable energy industry, he was appointed professor at Hamburg University of Technology in 2018. Roland Vanden Eede (1956) studied industrial engineering in electromechanics (Diploma in 1981) at the Institut Supérieur du Hainaut in Mons (Belgium). He has extensive international experience, holding project management positions at renowned consulting companies. Roland Vanden Eede has long-term experience in power system simulation and modelling as well as in the preparation of sub-regional electrification master plans. His project experience relates to planning and engineering studies for the rehabilitation and extension of electrical networks and other technical and economic studies and assessments to improve energy efficiency. Roland Vanden Eede was part of the team that founded intec. Rached Jomni (1962). With a Bachelor’s degree in electrical engineering from the University of Quebec and a Master’s degree in Applied Science, Power Engineering, from the École Polytechnique de Montréal, Mr. Jomni draws on some thirty years' experience in the international engineering consulting business, further promoted through a successful cooperation with well-known Canadian consulting companies. He held a series of managerial positions of increasing responsibility, from Project Manager and Regional Director to Vice-president. Rached Jomni joined intec in 2016 as Executive Director for Energy. Ognjen Paleka (1951) holds a B.Sc. in electrical engineering from the University of Sarajevo, former Yugoslavia. After an initial career with the Bosnian major engineering company, he worked for several Canadian engineering and manufacturing companies. In 2007 Ognjen Paleka moved into energy consulting and was employed by an international consulting company operating in the United Arab Emirates. He started his activities with intec as Senior Project Manager in 2012 and since then has managed several complex projects in the field of HV & EHV transmission. Frank Preschke (1966) is a graduate of the Technical University in Braunschweig, Germany with an M.Sc. in electrical engineering. He started his professional career as an engineer and project manager with German technology companies. From 2005 until 2009 he worked as a consulting engineer and project manager with a renowned international consultant. In December 2009, Frank Preschke joined intec as Project Manager and, since then has managed large-scale projects in the field of high-voltage substations and transmission lines (up to 750 kV).